Our community enjoys a rich and complicated history. With a stage set by geology, topography and climate, successive waves of inhabitants have shaped and reshaped the community we know as Laurel Canyon. 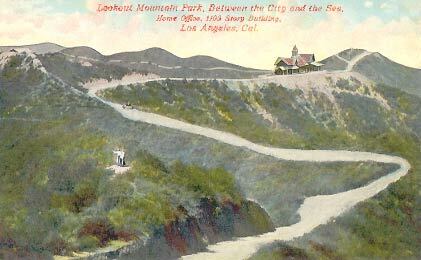 The road to Lookout Mountain in the early 1900's. The Lookout Mountain Inn, which burned down a few years after construction, as well as a short trackless trolley line, was built by Charles Mann as a lure for vacation home buyers. The real estate industry is still reaping the benefits of his creative marketing skills. The Harper Estate at the base of Laurel Canyon around 1900. That's Colonel Harper in the foreground, a beneficiary of the Yankee take-over of New Spain. Los Angeles Examiner, Feb. 6, 1909: "That Laurel Canyon is fast growing in popularity as a year-around resort is shown in the great increase in the number of visitors which frequent it every day. From early in the morning until after sunset, numerous tourists and local people may be seen along the canyon road either going to Lookout Mountain or returning from a trip to the famous view-point." "During the past year a county road has been built from the mouth of the canyon to Bungalow Inn, which is situated about halfway through the pass, which will make it one of the most famous drives of Southern California. The roadbed is composed of decomposed granite, which was taken from the sides of the hills when the cut to widen the trail was made. It is about 30 feet wide, with an extra width around the many pretty curves along the way." "Nestled close to the side of the high mountains and with vine-like windings on account of which it is impossible to see more than 50 yards of the road at a time, the road fills the merry traveler with great romance which is never forgotten. Clustered about Bungalow Inn, a little city has sprung up within the past two or three years, which adds much to the pleasure of the visitor. Like the typical mountain homes, these hug closely to the sides of the mountains, while numerous terraces lead up to them from the little stream below. Everything is planned to meet the intricacies of nature builders." "Among the pretty little homes, Kennith Redpath has one of the most beautiful, while that of County Supervisor Eldridge is elegant in the extreme. Mr. Eldridge's home is built snug against the side of the mountain, while the frontage is a series of terraces from the little mountain stream below." "Above the little bungalow city, the road makes a rapid ascent to the top of Lookout Mountain. Until a few weeks ago this was only a trail, but it is now being fast graded into a wide roadbed which will admit of the passing of two vehicles. A large cut has been made so as to make the ascent more gradual." In order to move forward, we need to understand how miserably the old system of irresponsible development has served us. We need to understand that the Property Rights First advocates, whose real agenda is profit, had their chance and made a mess of things. The following image gallery contains photographs taken around the turn of the century, before speculators and developers began the process of destroying paradise. The famed urban design firm headed by Frederick Law Olmstead Jr.and Harlan Bartholomew recommended in 1930 that all undeveloped areas of the Santa Monica Mountains be preserved as a watershed and recreation area for the public good. County Supervisors, many of whom were subsequently investigated for collusion with developers, ignored this and other ideas that would have preserved a mountain green belt around the city. Thus the stage was set for virtually unregulated growth in the hills. The only control was the cost of development. The easiest buildable sites on natural terraces and the crests of the hills were developed first. Then came excavation, and stilt houses, and caissons, and finally the massive retaining walls. Olmstead and Bartholomew recommended that LA's rivers and streams be preserved as a riparian parkland threading through the city, but flooding that had periodically rejuvenated farm land now threatened the property speculators had bought for future housing. They pressured the City and the Army Corps of Engineers to pave the river over turning it into an open air sewer for poorly planned communities and industry. For a time, the run-off destroyed fisheries at Santa Monica Bay and the harbor at San Pedro. In fact, there was a vast and complex public transportation system in place that could have served well-planned development nodes while preserving green space between urbanized areas. But, the speculators, the developers and the real estate marketers joined forces with the tire industry to destroy the Red Car lines. They proceeded to pave over a third of Los Angeles with roads, parking lots and driveways. By 1970, that was 250 tons of cement per inhabitant. Whenever these historical issues are raised, there is little debate that serious mistakes were made by city planners in the past. But when we raise the specter of land use control today, the same sorts of property rights advocates who made a mess of things in the past protest about the government stealing their wealth. But if we really want to make a difference in Laurel Canyon, the first thing we must understand is that the public good must come before private property. We must think like a community and not like a bunch of independent property speculators. And if we succeed, our individual properties will be worth far more because we will have preserved a bit of paradise in a city gone out of control. 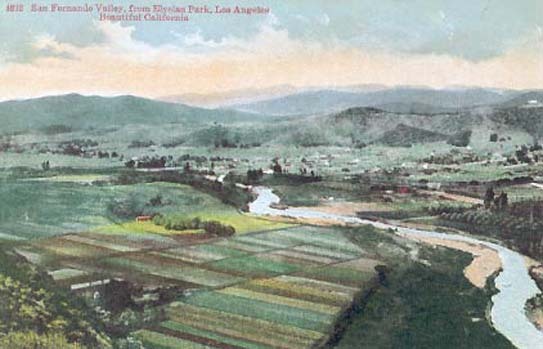 The San Fernando Valley with the Los Angeles River near Cahuenga Pass at turn of the century. As early as 1902, a trolley system ran from downtown to Santa Monica, stopping at the base of Laurel Canyon. "It costs so much in the long run to adapt rough mountain lands satisfactorily to ordinary intensive private uses that their real net value as raw material for such use is generally far less than their value for watershed protection and for public recreation. Unfortunately in the local speculative market this fact is often ignored and subdivision sales are made which commit the community to extravagant wasteful private and public expenditures for converting a good thing of one kind into a poor thing of another kind." Beautiful and broad views from individual dwellings (in the hills) can hardly atone for the lack of a comprehensive and convincingly landscaped neighborhood design and for lost communal opportunities." "The traditional view toward private ownership of property that permits the temporary owner a proprietary interest has been outmoded by a new knowledge of man's relationship to nature and to the community. This knowledge demands a new attitude toward ownership of land, substituting the concept of trusteeship for exploitation." "Flying from Los Angeles to San Bernardino— an unnerving lesson in man's infinite capacity to mess up his environment — the traveler can see a legion of bulldozers gnawing into the last remaining tract of green between the two cities, and from San Bernardino another legion of bulldozers gnawing westward." William Whyte, author of The Organization Man, who coined the term "Urban Sprawl" in an article for Fortune Magazine, 1958. "County government in Southern California is so hopelessly captive to the land development industry that sweeping electoral reforms are probably the prerequisite for overthrowing the "new octopus" and transforming land use priorities." Mike Davis, Ecology of Fear: Los Angeles and The Imagination of Disaster, 1998. Richard Seireeni is a graduate of the University of Washington Department of Architecture and Urban Planning. His graduate thesis was on Campo dei Fiori, the 2,000 year old marketplace in Rome. He was a designer for the Pike Place Urban Renewal Project, a government initiative credited with saving Seattle's historic market center. His lifelong interest has been the creation of community in modern cities. He lives in Laurel Canyon with his wife and two children where he is credited with cementing neighbors through innovative digital media and defining common cause.